Review: I loved this book even more than the first. It's a parallel story line one taking place in the present, the other many years in the past. When you break down the two parallel stories into their parts very little happens; but when you put this book together with the first it is an amazing ride. I think this book is best read right after Silver Phoenix. My only complaint with SP was that it went too fast and didn't focus enough on the details. My only complaint with this one was that it didn't have as much adventure as the first. Put them together, and you have the perfect book. 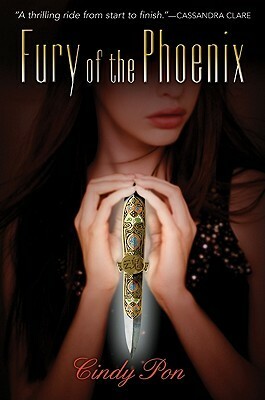 Although less fantastical and "epic," Fury of the Phoenix is the epitome of masterful character creation. I think I will now dub Cindy Pon the master of creating the sympathetic villain. By the end of this book I WAS IN LOVE WITH THE VILLAIN! When does THAT ever happen?! How have I not heard of these? Gah! I want to read this! I love great villains! But anyway, I tend to love what ever books you love and I'll definitely get to reading this series eventually. It's just a shame with the white washing. I remember this one didn't have as much adventure. I need to do a reread cause its already faded from my memory so much. But I'm glad you loved it! "When you break down the two parallel stories into their parts very little happens; but when you put this book together with the first it is an amazing ride." Ooo, very interesting and good to know. We'll be sure to read them together, then. Thanks for the tip and for sharing your thoughts!